On July 26, Benevity, which describes itself as "the global leader in corporate social responsibility and employee engagement software," announced the "top ten causes" that received donations through its platform in June 2018. Benevity reports it "saw a big boost in giving to immigrants' rights organizations following the news about family separations at the U.S. border." June was apparently a progressive month. And yet its "top ten causes" feature two deeply un-progressive organizations. 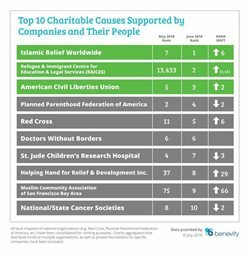 Islamic Relief Worldwide (IRW) was named by Benevity as the top recipient of donations by its corporate clients. Perhaps partly buoyed by Ramadan, in which charitable giving is regarded as particularly important, anyone who has been reading the Middle East Forum's latest research will know this is alarming news. Founded in 1984, the Islamic Relief franchise is managed by Islamic Relief Worldwide, its headquarters in the U.K. It has branches all over the world – from Sri Lanka and Pakistan, to the United States and Canada. Islamic Relief is one of the largest Islamic charities in the world. But increasingly, government and media around the world are investigating its ties to Islamist networks. Over the last few years: the United Arab Emirates designated IRW as a terrorist organization; UBS and HSBC shut down its bank accounts; the Bangladeshi government banned Islamic Relief branches from working directly with Rohingya refugees over reported fears about radicalization; Germany's Federal Court of Auditors opened an investigation into Islamic Relief Germany's use of taxpayer funds; a Swedish government report named Islamic Relief Sweden as a front for the Muslim Brotherhood; and the UK Charity Commission started investigating IRW's involvement with an extremist preacher who advocated the death penalty for homosexuals. In the United States, the Middle East Forum caught Islamic Relief USA chairman Khaled Lamada and senior official Yousef Abdallah inciting violent hatred against Jews. Lamada circulated text praising the "jihad" of the "Mujahidin of Egypt" for "causing the Jews many defeats." He republished claims on Facebook that praise Hamas for inflicting a "huge defeat" against the "Zionist entity." In Gaza, IRW and Islamic Relief Palestine fund the Gaza Zakat Committee, which works closely with the Hamas terrorist regime, and is led by a cleric closely involved with Hamas's senior leadership. The Middle East Forum's report into Islamic Relief, published in June 2018, found further evidence of financial connections to groups tied to terror, extremism promoted by senior Islamic Relief staff, and the regular promotion of dozens of hardline Salafi preachers. Another featured charity on Benevity's list is Helping Hand for Relief and Development, an arm of the Islamic Circle of North America (ICNA). Helping Hand came in at number 8 on Benevity's top ten list. Helping Hand, like its parent organization ICNA, is a U.S. outpost of Jamaat-e-Islami, a violent South Asian Islamist movement which took part in the mass-murder of Bangladeshis during the 1971 Liberation War. In the decades since, Jamaat-e-Islami has been complicit in violence across the subcontinent. As a result, the U.S. government has designated the head of JI's paramilitary wing in Pakistan and Kashmir, Syed Salahuddin, as a "global terrorist." ICNA has previously openly identified as an arm of Jamaat-e-Islami, while Helping Hand chairman Mohsin Ansari is an alumnus of Islami Jamiat-e-Talaba, the student wing of Jamaat-e-Islami's branch in Pakistan. Ansari frequently promotes JI on his Facebook account, and attends JI rallies and events in America, Europe, and Pakistan. Helping Hand openly consorts with terrorist groups in South Asia. In December 2017, HHRD organized a conference in Pakistan, to which it invited the Falah-e-Insaniat Foundation and the Milli Muslim League, the charitable and political wings respectively of the Pakistani terrorist organization Lashkar-e-Taiba. A year before Helping Hand's conference, in 2016, the Falah-e-Insaniat Foundation was designated by the U.S. government as a terrorist organization. The Middle East Forum has repeatedly published research about Islamist organizations exploiting corporate charitable efforts. How many tens of thousands of American workers' hard-earned dollars are being given to extremist charities that have perfected the art of appearing progressive? It is time for corporate giving platforms, American companies and their foundations to reject these Islamist behemoths, and instead support moderate Muslim charities, which, thanks to the powerful PR efforts of Islamist networks, have yet to appear on any "top ten" list.